Three sisters reunite for the funeral of their mother after having not seen each other for an extended period of time. 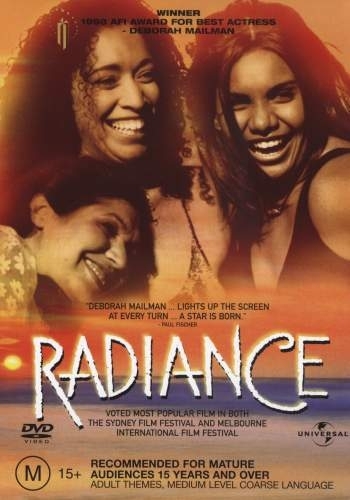 Based on the play of the same name by Louis Nowra, Radiance is the third feature film directed by an Indigenous person, following Jindalee Lady and BeDevil. The film explores the relationship between Mae (Trisha Morton-Thomas), Cressy (Rachel Maza) and Nona (Deb Mailman), and is one of the rare times in cinematic history that the emotional interior of the lives of Indigenous women have been explored, especially in a feature film format. The significance of cultural identity falls away to reveal three central characters who are concerned with notions of family, belonging, and home. Adapted for the screen from Louis Nowra's stage play. Radiance is set in a fictional small town overlooking a beach in the Queensland canefields. The town is identified in Louis Nowra's play only as being located in North Queensland. In Nowra's introductory essay to the 2000 Currency Press publication of the play and film scripts, 'Women on the Mud Flats', Nowra describes a period of time he spent at Kinka Beach, QLD as being the inspiration for the location of the sisters' home and nearby "Nora Island," which is based on Great Keppel Island. Coordinates are given for Kinka Beach as the narrative setting.